And so it begins… The dawn of a new era at Slightly Deranged! See, I wasn’t kidding with my last post: the update was really coming soon. In fact, I have been tiding up several things here and there for the past couple of days. I hope you like these changes and the new slogan, although I believe there’s more polishing coming up soon; I fear that sidebar is getting too bloated now that I’m adding a new category. That’s right, the very first book in our new section is being covered today, and it’s a great one: J.G. Ballard’s High Rise, just in time before the Vincenzo Natali’s movie adaptation hits the streets. It’s a harrowing read, a very uneasy look into our most darkest emotions, but well worth your time. Additionally, we relive possibly the best platform game that ever appeared on the IBM PC: Zeliard, product of the Sierra On-Line/Game Arts partnership back in the early 90’s. It’s a truly amazing game and it brings back very fond memories. However, the entree of the day is definitely this long forgotten gem (how many of these exist anyway?) 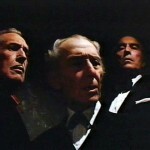 released just a bit after the sad demise of the Hammer Films studio, at least when it came to movie productions: House Of The Long Shadows, the only movie featuring Peter Cushing, Vincent Price, Christopher Lee and John Carradine. Equally funny and scary, this historical piece is inexplicably unbeknownst to a whole generation of horror movie fans, and it is my duty to tell you all about it. That’s it for today (heck, did you want more??) and I’m looking into a few more interesting changes and a higher update rate. As always, your support and comments are important so don’t hesitate to chime in if you have anything to say, even if it’s nasty and it could hurt my feelings, although you would have to be really nasty and potentially very graphical to offend me. It’s good to be back, and I hope someone reads the blog on Saturday! Did I Say Next Week? Bloody hell, I should know by now not to commit to any dates. As you may have realized by todays announcement (Scratches Director’s Cut being re-released by Meridian4), I’ve been awfully busy these past few weeks and, as usual, Slightly Deranged took the hit. But I’m working on the write-ups right now, and they are all going to be much larger than usual. I’m hoping to upload all the new content tomorrow… yes, TOMORROW! Oh boy… I just did it again. You are currently browsing the Slightly Deranged blog archives for October, 2010.